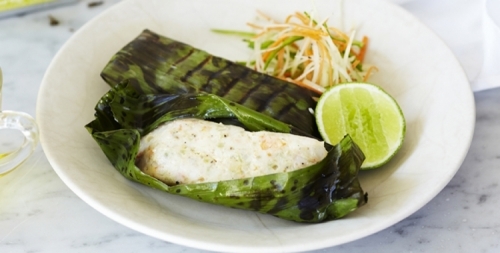 Cut the banana leaves into 30cm x 30cm squares and run under an open flame to soften it (you will need 12 pieces). Use a large shape knife to finely chop the lobster or prawn meat and fish (do not use a food processor as this will make the mousse rubbery). Add garlic, ginger, eschallot and chilli and use your hands to stir until just combined. Add egg and stir until well combined. Set aside for 5 minutes to rest. Place pizza stone or oven tray in oven to preheat. Place 100g of the fish mixture into the centre of 2 oiled banana leaves. Fold sides over to enclose filling and secure with kitchen string. Repeat with remaining fish mixture and banana leaves to make 6 parcels. Cook parcels on pizza stone for 5 minutes. Turn parcels and cook for a further 5 minutes or until cooked through. Meanwhile, combine the carrot, paw paw, chilli and lime juice in a medium bowl. Place parcels on serving plates with carrot salad. Serve immediately with lime wedges, if desired. Wash the rice and place it in a large pot with the water and cook till it is overcooked or is a porridge like texture. Puree with a hand blender till nearly smooth but still contains small pieces throughout. Crush the Ceylon Green Tea leaves in your hand and mix the tea leaves into the still warm rice porridge. Spread the mix onto the silicone mat 1.5mm thick. Dehydrate in an oven with no fan at 50°C until dry but still pliable. Break into large fragments and keep dry. Heat oil to 190°C. Deep fry fragments until they are puffed and crisp, place on paper towel to drain, serve immediately.